Get more out of mass? Pray in a more powerful way? Be a service of God through service in his church? Contribute to enhancing our liturgical celebrations? Cultivate new friendships with fellow parishioners? The ministry of the Cantor is to lead the congressional singing during the Liturgy and to sing the Psalm verses, as well as the Gospel Acclamation verses. Cantors rehearse approximately every six weeks at 7:00 p.m. on Thursdays. Rehearsals are recorded, and a CD is then given to each cantor to use for future reference. Cantors are also expected to be at Mass early enough to go over the Psalm with the organist, as well as any other music that may need attention. Extra help is gladly provided by the music director when necessary! A cantor should have a pleasing voice, be able to somewhat read music, and have the confidence to sing solo and lead congregational singing. Choir membership is encouraged for cantors, and is a great way to prepare for cantoring. Directed by Judy Biros with instrumental director George Biros on piano, other instruments which accompany this choir include: guitars, percussion, and trumpet. Rehearsals are every Wednesday night from 7:30 - 9:00 p.m. Choir sings at the 9:30 a.m. Mass on Sunday. The "regular" season is from mid-September through approximately the first week of June. Director, accompanists, and cantors meet every other week for rehearsal throughout the summer, and provide leadership for the congressional singing during the summer months. The Contemporary Choir combines with the Celebration Choir for major celebrations such as Christmas, Holy Week, Easter, Confirmation, etc. To join one should have a desire to sing and the ability to carry a tune. Ability to read music is helpful, but not necessary. Regular attendance at rehearsals and Masses is expected, occasional absences are considered unavoidable. The Celebration Choir sings at one weekend Liturgy each week, alternating on a monthly basis between the 5:00 p.m. Mass and the 11:30 a.m. Mass. It is accompanied primarily by the piano and organ. Directed by Judy Biros and accompanied by George Biros on organ and piano, the Celebration Choir performs songs predominantly from the Gather Comprehensive Hymnal. The choir performs an additional Prelude song each week. Songs range from classical to contemporary in nature. The "season" begins in the fall and continues through the Feast of Pentecost. The choir takes a "break" for the summer months. The Celebration Choir combines with the Contemporary Choir for major celebrations such as Christmas, Holy Week, Easter, Confirmation, etc. To join one should have a desire to sing and the ability to carry a tune. Ability to read music is helpful, but not necessary. Membership is open to high school students through adults. There is a particular need for male voices. Rehearsals are every Tuesday night at 7:30 p.m. The Children’s Choir sings once a month at various Masses. 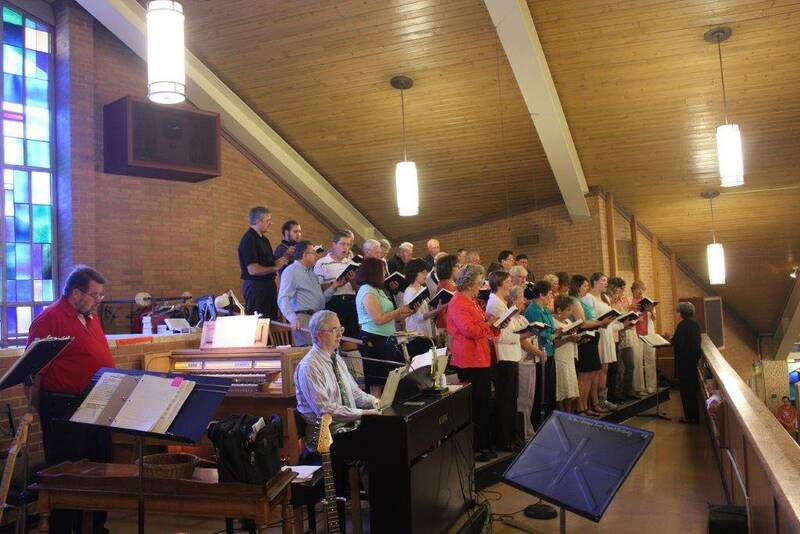 The choir rehearses Wednesdays from 6-6:30pm in the Church. Membership is open to students in kindergarten through 4th grade. Additional instrumentalists are used occasionally for each choir for regular weekend liturgies, as well as special Masses. Trumpets, flutes, violins, and saxophones have been used in the past. Ability to play in an ensemble situation is necessary, and attendance at rehearsals for the designated celebrations is required.